Kimono’s are making a comeback – yay! I am looking for a warrior kimono robe, with suitable hanger for a wall display, as decoration. Do you have such an item? I am not sure what you mean by warrior kimono. You may mean a black, silk montsuki kimono (montsuki have 1, 3 or 5 mon on them), which were also worn by samurai. I do have some montsuki kimonos on my site at http://www.wafuku.co.uk in the Men’s/Kimonos section. I also have extendable kimono hangers available in the Misc Items section of the site. To display it, you can, however, also use a length of simple bamboo or thick cane, from a garden centre, long enough to go from sleeve end to sleeve end, with just a string loop at the centre to hang it, then pull out the fronts and clip them to the sleeves or pin them to the wall. I would like to know how to find the meaning of the Meiyu (4 eyes) mon and so far I’ve had no luck. This is in my family (from my gr. grandfather’s side, passed through his father) as well as the Ageha-cho mon (from my gr. grandmother’s side, passed through her mother). When I saw the Meiyu mon on this site I hoped you’d be able to give me an answer, or at least point me in the right direction to finding it! The 4 eye mon is one that proves problematical. It would appear its meaning has been lost over time. I have found no answer to its meaning when researching mon, though I have searched a good deal. It is also known as Yotsume (四つ目)and was the mon of the Shinozuka (with a ring round the 4 eyes), Ichikawa and Sakō clans. My presumtion is that its meaning is about vigilance and being observant but that is a guess. There are dozens of variations of this mon, sometimes laid out in a diamond shape, sometimes square or overlapping diamonds, in a kaleidoscopic effect etc. and there are 3 eye versions too. Sorry I can’t be more helpful but the reason you have found it so hard to get information on it is that there seems to be none available. It is a question many with an interest in mon have asked, all having failed to find an answer. I too am trying to find out more about this.I have recently required a full suit of armour with the crest. I would be grateful to be in contact with you to exchange findings. I’m afraid I know nothing more about the mon. If you are on Google+ (G+) then there is someone who goes by the name Scooby Doo Jedi and posts a lot about Japanese mon, who may be of some help. I have an old Kimono….black crepe with surihaku running around the hem and up the the left panel. 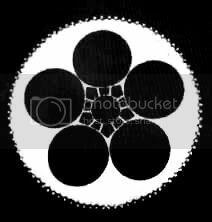 There are 5 crests that seem a chrysanthemum shape. I have a blog: http://ladynyo.wordpress.com where I have written about this kimono, but I would like to know if this chrysanthemum is common. I would think so. I checked your blog but could not find a picture of the kimono you mentioned with the chrysanthemum (kiku) mon. The 16 petal chrysanthemum mon was the Imperial seal of Japan and only used by the emperor, at one time, at least. It has 16 petals in front and the tips of a back row of petals showing between them at the ends. Other members of the imperial family used chrysanthemums with different numbers of petals. I don’t think that such restrictions still apply but I really don’t know. I have seen that mon on items like boxes etc. that are not imperial family items, although it is still the National emblem of Japan. I have well over 2000 kimonos and haori (I didn’t stop buying when I hit that number, I just stopped counting), many of which have mon and a wide variety of mon but only two or so have the chysanthemum one and I do not know their provenance. There are dozens of variations of chrysanthemum mon designs but it is certainly not one of the more commonly found ones, as far as I can tell from my years of kimono buying. I’m afraid I’m no expert on mon, though. Perhaps it is possible that your kimono was owned by a member of the imperial family, you never know. Oh~! Thank you! You have been very helpful. I will photograph my black crepe kimono (tomesode) and put it up on my blog. Thank you for looking at my blog. I am working on “The Kimono” this January (novel) and will post a pix of the kimono that has inspired me to write this book. As to the crest, it might be ‘ivy’, but I have to look closer. What a wonderful and enlightening site you have here! I LOVE your site! It is a world of information for me, trying to write a novel about 16th century Japan, “The Kimono”. I will spend some time today reading your site carefully. I have been curious about the Mon and Kamon for a while, have you any ideas or maybe have learnt why they are always in circles, and why they are symmetrical? Mon are usually in a disc shape but not always. sometimes they are diamond shape, hexagon, cross shaped, square or rectangular or just are just something like a single butterfly or blossom on its own, not enclosed at all. The symbol being enclosed does make it clear it is a mon and not just a decorative thing. Thank you for answer those questions. I have a 70 year old Japanese samurai Yoroi (Armour) the Mon is on the Dou (Body Protector) and i cant seem to fing to which family it belongs to. the crestis in a Circle, and it has what I can describe five spheres or balls and in the middle whith what looks like a sun with rays. I would really appreciate it if you could help me on this. I’m not certain but the crest you speak of sounds like umebachi, a plum blossom. There are many variations of it but there is one with five disc shapes, representing the petals, and what you describe as sun like rays in the centre would be the flower stamens. I can’t be sure without seeing it but iit certainly sounds like that one. i’m looking for a mon depicting a camellia? any suggestions? In the many hundreds of mon I’ve seen, in books and on actual clothing, I’ve come across peony, fringed pinks, cherry blossom, plum blossom, balloon flower, chrysanthemum and many, many other flowers but I’ve never seen a mon with camellia, although it is a very popular flower in Japanese textile art and on many of the Japanese kimonos, haori and obis I have, so I’m rather surprised I’ve never seen it in a mon. Is there a mon which features a symbol for the lotus flower? I have been looking everywhere and have not come up with anything. How can we find out more about the family who originally had the kimono? I doubt you can track it back to the family who owned it. Many families use the same crests, they can choose one that their family has long since used or just choose one they like and wives can wear their own family’s mon if they want. Mon are not exclusive, so the mon on yours could apply to thousands of different families. You can sometimes find out what mon a family uses, such as the Emperor, whose mon is chrysanthemum (kiku), his always is a 16 petal one and I think, out of respect, no one else wears the same one, though others wear chrysanthemum, but that is the only one I know of that is restricted to one family only. So a mon isn’t likely to lead you to the family that owned a kimono displaying it. The mon on your kimono is cloves (chôji). People may not even be wearing their family mon (kamon), they could be wearing one that applies to something else. Maiko (apprentice geisha) wear a long obi that hangs low at the back and has, on one end, a large mon that is the mon of their geisha house. Also, when second or third son in the family marries and establishes his own family, often he modifies his father’s crest, showing his heritage and differentiation. The first son carries the original from his father. All the sons may choose to keep using exactly the same mon as the father or could come up with a modification of it or placing a ring, square or other border around it, combine it with two or three other mon, combine the father’s with an entirely new and original mon design etc. So that can make tracking one back even more impossible. Even when a son alters his fathers, it is likely other families somewhere have that same variation, even though there are thousands and thousands of mon. the choji mon is for the Hata family. And thank you for sharing precious information about what I find being a very specific and refined aspect of Japanese design. You mention that Mon can be found on a variety of items, like signs, ceramics, and of course fabrics. I was curious to know if they were also used in jewelry, or, if not, if it is simply culturally inappropriate to do so. I had pendants or rings in mind. I have seen mon on obidome, which is a sort of brooch like thing, worn at the centre front of an obi, with the obijime (obi cord) threaded through it. I have also seen them on kazanshi (hair ornaments). Traditionally, an obidome is the only jewellery that is meant worn with a kimono outfit, plus, if wished, the ornaments in the hair. They don’t wear any other jewellery with it, though young women nowadays sometimes break the many rules applied to kimono wearing and may add various things that traditionally would never be worn with them. I don’t think there are any cultural taboos about mon on jewellery at all but rings (other than wedding) and pendants are not worn with kimonos. As for contemporary jewellery, worn with more westernised style clothing, I have seen some with mon, available in shops in Harajuko in Tokyo, so it is done, though I don’t know if it is widely popular or not. I have seen mon that is a gold circle with a gold disk in the middle, it reminds me of a simple bulls eye. However, I haven’t seen this mon anywhere else so can’t figure out what it means. Would you have any idea ? I can’t see what ‘this mon’ is, I’m afraid. There is no link to a picture. the later part of the 19th century, through to the early 1920’s in Satsuma in southern Japan. A normal piece of Satsuma will be of a yellowy skin tone and typically enhanced with minute and complex Japanese amounts, landscapes and even monsters. The layouts additionally showcase a form of decoration called Moriage which is a term used to explain using raised enamel seen on many pieces of Japanese and eastern pottery. My husband’s family crest is sumikiri kaki ni chigai shoji. We know his ancestor was samurai in Kyushu, probably Kumamoto. Do you know any history related to this kamon? No, sorry, I don’t know any. I am curious, I have seen many beautiful examples of Japanese ceramics from 1200-1350. ( Ko-Seto ware in Books & Museums) It seems the most popular chrysanthemum motif or design is the 16 petal mon and then I’ve seen also 24, 22 & 12 petals also. Now , I am familiar w/ Emperors GoToba ( b.1180 – 1239) & Emporor Go-Diago (b.1288-1339) who were both exiled at one point in their lives to OKI island. During their exiles they both used the 17 petal mon. In your opinion, would an authentic stoneware vessel of Kamakura Period have any significance if it has many 17 petal mons stamped on it? Again I’ve seen about 100 examples of Kamakura Period and only have seen one w/ 17 petals! I’m afraid I don’t know the answer to that. I have a gold pendent with my family mom but I need a actually print copy of it for a tattoo. It’s a flower mon. Our last name is Kawasaki. There are many hundreds of different flower mon and a family mon does not relate to the name, a family may have any mon they want as their kamon (family mon), so one Kawasaki family could have a different mon from any other Kawasaki family. I suggest you go to Google Image seardh and look up Japanese mon, you are bound to find your one there. Is the crest color can be anything to be looks great on the Kimono style/color? I asked these two questions because I saw some crests on few people’s Kimono have their own kind of colors? The colour of the crest has no meaning. Colours have meaning in Japanese kimonos inasmuch as one wears much more muted colours as one gets older, no more bright reds or such, and black kimonos are formal etc but in terms of just the crest, its colour isn’t meaningful, it can be in any colourway, the colour is only dictated by the item it is on. But do we normally put crest on Hakama? But do crest has to be in a specific size? or we can do any crest size we want on the Kimono? Size is whatever you want it to be, there isn’t a hard and fast rule but around 2.5cm in diameter is the standard and most common size found on kimonos and haori. Ok thanks very much for your answers! And this shall be the last inquiry about the “crest”. Do we usually put crest (s) on Yukata and Jupan? Only on formal kimonos and formal haori, not on juban or on informal kimonos. You will not find it on yukata (the most casual of kimonos) or other informal kimonos. You will find it on men’s montsuki kimonos and montsuki haori and women’s tomesode kimonos and formal haori. Is the “Traditional Japanese Samurai Kendo Kimono” qualify for the “formal kimonos”? I need help in identifying my family’s crest on a Komo. I received it after my fathers death. It is my grandfathers on my late mothers side. I was told that he was powerful. He is also dead. I see that from your page you know more than anyone else seems to know. Mon are not usually exclusive to any one person or family. The Imperial family have their own and there is a specific yakuza mon but generally anyone can use any mon, so I won’t know anything specific about your family’s one. I have 2 cotton panels with mon signs dyed on them.Indigo blue and white.Are these anthing You would be interested in.I can send photos. No. I am not looking to buy anything more at all.